I'm glad you're fulfilling a literal dream, hehe. It's looking pretty nice. Little suggestion on the cannon. You could add some recoil along the barrel's axis. A purely vertical bounce almost suggests that it's mounted on an unstable mount. I shifted the frame with the white flash backwards by one pixel. It's almost imperceptible but I think an extra motion like that would help imply the power of the cannon. Again, great job. I'd love to try this out when it comes out in beta. I agree with rustEdge. The cannon seems really wobbly (especially at the barrel) which might be alright since theyre small sprites I think it should definitely shift horizontally some more if your going for this musch recoil, otherwise love how its looking. I especially like the death aninmation. Thanks rustEdge, that makes quite a difference! I sort of constricted myself with the animation I could do by limitting the canvas size to 20x20, but really there's no reason why it couldn't be expanded to 24x24 to make comfortable room for whatever motion I need to do. It looks odd how he changes hands as he rotates around, but I don't think it would be such a huge deal in-game. The token for the Grenadier. I wanted to give him a real action pose, show he has power. Basically I want all the tokens to look really appealing, like you see it and go "oh cool, I want to use that!" Refined the Cannon explosion animation some more with Jad's help. Has a better feeling of impact now, I think. It looked really sweet though, especially at such low res, yet so highly animated. Not much to comment, but if I have to nitpick... probably the building... doesn't look too exciting in comparison. PS : Why is everyone using Arne palette? and where can I get it? True. At the moment its mostly about keeping the buildings loaded up with race and team colours. But when I expand the palette I'll work on more detail. I suppose I could do a redesign, they were pretty quickly sketched up off the top of my head. Well I can't say exactly why other people are using it, but I decided to use it because its a very versatile palette, its a fun restriction, and working with less colours generally leads to a faster work flow for me. Arne's palette can be found in the feature chest. I didn't want it to be too many frames, but I ended up with 12 frames and just couldn't figure out a way to cut it. 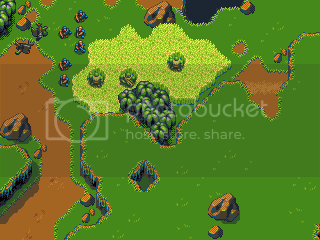 Added this tall grass tile type. Units that remain still while standing in it become hidden, allowing for ambushes, desperate escapes, or stealthy infiltration. Will probably give the grass a cast shadow like the rocks. Certain abilities like Spy Plane as well as walking right next to a unit hiding like this will reveal them to that player. Also did a quick rock to see what was possible with the palette. I'd try out having him remove the pin simultaneous to winding up for the throw, you could probably cut the pre-throw frame count to 3 or 4 that way. Another idea could be having the throw immediately, and then he pulls out a new grenade and removes the pin on that at the end of the animation (implying that when running around the pin is always removed :D ) since the pin is just a safety for the lever; gives you a good reason to make them explode on death, too! So let me get this strait! You have three teams: humans robots and mutants, right? Why do you not make a red team? the ailiens!!! That could spruce up the look a pit! And You could make the screen a little bigger so that it is not a phone game(i hate phone games). I live the explosion, the blast wave is totaly awsome, but, it is a little funny. why not make a bombardment explosion that was made by a falling bomb. You have to take into account that this was developed to be looked at on either TV sets or CRT monitors, which blend dither, esp 50% dither a LOT more than any LCD ever could, because of the way they work. So really it would not look that noisy, more like patches of different colours in most cases. I've thrown in some extra colours. 1 for the grass and 2 for the dirt. They're most likely place holders until I get to a more encompassing palette expansion that puts the colours to their full utility. I just needed some colours for now so I could do the cliff ramps, basically. During my playing around with the tilesets, I figured out that snow and desert tilesets are probably possible, though they'd both be quite bright, so I'd have to do a bit of playing around with the sprites on them to see how readable they'd be. The other issue is that the long grass that units can hide in offers a game mechanic that would have to be mirrored in the other tilesets for each tileset to be equal, gameplay-wise. How do you justify patches of tall grass in a desert? In a snow-covered landscape? Some cool ideas, thanks I'll keep them in mind. My reasoning for the delayed attack is that the Grenadier can be massed pretty easily, being an early, cheap unit, and it has AoE damage and a powerful kamikaze ability. So in an attempt to keep them balanced, they needed a disadvantage, which at the moment is their delayed attack. This gives enemies a small chance to scatter their units to minimise splash effect. But against slow or static targets, or against very large crowds of enemies that get in eachother's way, the Grenadier will be a powerful unit still. That's the plan, anyway. If play testing shows it doesn't really work that way and it's too much of a disadvantage I'll definitely try out your suggestions. Oh and they only explode on death if you order them to use their Sacrifice ability. A few problems with that idea. First, there's not enough reds in the palette (as far as I can figure) to base an entire team style off. But that could be remedied in the palette expansion, I guess. The main issue is that I want this to be a story about Earth and the kinds of forces that have grown out of it. The idea of aliens coming throws the subtext out the window. This might sound ridiculous, considering the very cartoony graphics, but I do want the story to stand on its own merits as having something to say. Third reason I don't really want to divulge because it would be a bit of a spoiler. As for falling bomb explosions... don't worry, I'll get to the Napalm Strike animations as soon as the Grenadier is done. The grass/dirt transitions seem very noticeable now & appear a bit messy, I think the gray you removed was helping the transition a lot. The long grass is too spraycan-tool-y, I think - the appeal from the beginning was the very clean, uncluttered approach you'd taken. I think you could approach it more like the short grass & dirt (ie. expanses of flat rendering with texture variation tiles) & still have it read as long grass. I was actually working on an edit, but I couldn't do any better so I ditched it. Easy it ain't.